When does child support begin? The Maryland Court may only help you with child support from the time you actually file a request for the Court to make a finding that child support is due. The Court does not go back to the date the parties separated if no case has been filed. Prompt filing is imperative for the Court to grant retroactive support. Any Child(ren) born to the parties whether they are married or not. If their is a question about the legitimacy of a Child the Court can Order a paternity test. I just lost my job. Will the Court go back to date I was terminated? No, a modification of a Maryland child support order runs from the date of actual filing for a modification. If you wait two months from termination to file for a change in your child support obligation the Court can only grant you relief from the date you filed your request, not the date you were terminated. How does Maryland determine child support? How do I determine "Actual income"? (N) Alimony or maintenance received. If you get regular overtime and not occasional overtime the Court may include this as "actual income". This is a case by case situation that need to be carefully looked at. If you get overtime once every 3 or 4 months for one hour will be looked at differently then 5 to 10 hours every week. Will they consider private school? If the parties had previously agreed on private schooling the Court will look at the past history and what is in the best interest of the child. However, if the parties can not afford to continue paying for private schooling the Court may decline to include the cost of private school. Again this is on a case by case basis. 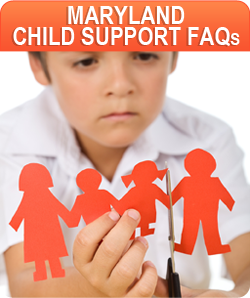 What is the formula for Maryland Child Support Guidelines? Maryland uses a table of mathematical numbers taking into account the number of children, overnights of greater then 128 nights and factors discussed in this FAQ article. Child support guidelines do not apply if the combined adjusted income in excess of $10,000.00 The Courts may, but rarely deviate from child support computations below combined incomes of $10,000.00 per month. 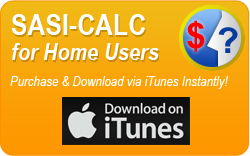 Most Courts use SASI-Calc software to determine the Maryland Child support. If the parties child(ren) spends in access of 128 overnights per year or 35 percent of the time with either parent the Court utilizes at separate formula recognizing more of a shared cost approach to determine Child support. What if obligor quits his job to avoid paying Child support? A person required to pay child support may not deliberately quit his job to avoid Child Support. This is called involuntary impoverishment. The Court can fine the non-paying parent in contempt of Court and incarcerate them. The Maryland office of Child support can ask for a tax intercept of any tax refunds, pull their right to drive in Maryland and even deny them the right to a certain travel/passport/visa rights if the arrearage reaches a certain amount thru state and federal reporting systems. regular over-time and part-time pay, per month. If the pay period is not a monthly pay period, press the “Calc” button adjacent to the field to pop up the monthly calculator, which will convert various common pay periods to a monthly amount. 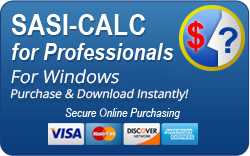 Recommended payment: This field displays the payment calculation performed by the SASI-CALC program. This field will display the correct payment recommendation after the calculate button is clicked on the main form. This field is not a user modifiable field.